Van Cleef & Arpels continued to focus on lavishly decorated watches with novel complications conceived for ladies at SIHH 2016. Here’s all you need to know about its line-up complete with original photography. Van Cleef & Arpels excels at delicately pretty ladies’ watches, usually elaborately gem-set or enamelled. 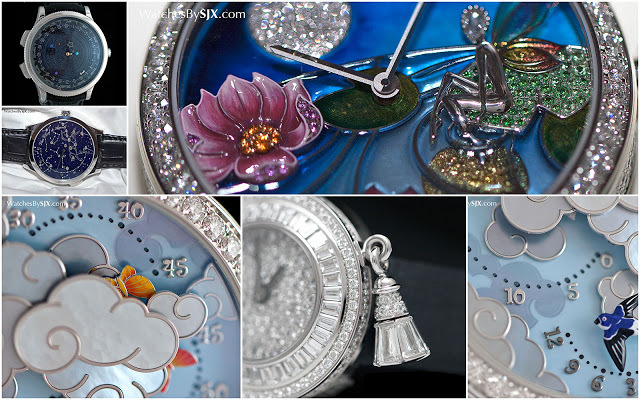 The jeweller’s offerings at SIHH 2016 stuck to what it does best, with jewelled fairies and enamelled butterflies taking pride of place on watch dials. But the most intriguing complication in the line-up is the Midnight Nuit Lumineuse. This has a dial made of aventurine glass, a type of glass with glittering metal inclusions. 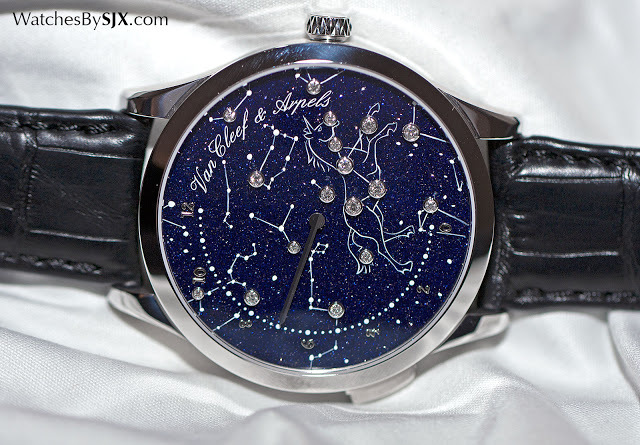 Polished, engraved and painted with a unicorn constellation, the dial is also set with diamonds. Six of the diamonds light up from underneath, thanks to the piezoelectric effect: certain materials generate electricity when subjected to mechanical stress. Pushing the button at eight o’clock is causes a ceramic strip inside the movement to vibrate rapidly, generating electrical energy. This in turn powers six diodes mounted underneath the six diamonds on the unicorn, causing them to light up for about four seconds. A patent is pending for this mechanism, that while intriguing, is too brief to be exciting. The rest of the movement is a tradition automatic movement, with only an hour hand that indicates the time on a retrograde scale from six to 12 o’clock. 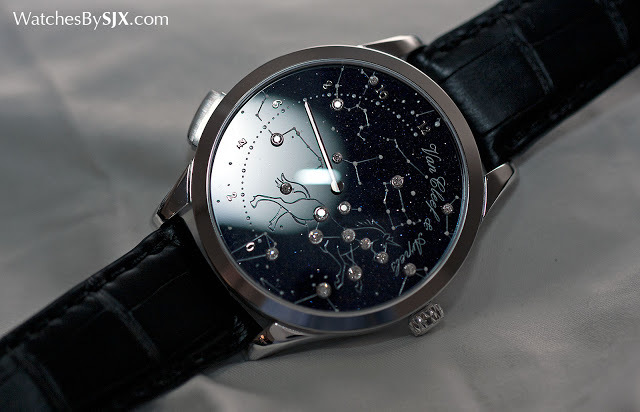 Like most of the other Midnight complications, this has a 42 mm case, in white gold. 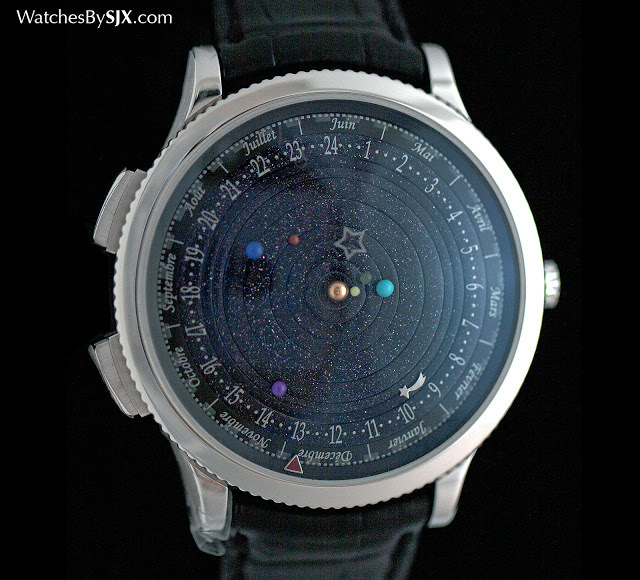 Also introduced at SIHH was the Midnight Planetarium in white gold. Featuring a miniature planetarium that shows the positions of all the planets in our solar system, the Planetarium was first unveiled two years ago in rose gold. The new white gold model is mechanically identical, with the planetarium complication originally developed by independent watchmaker Christian van der Klaauw, a Dutch specialist in astronomical complications. Another complication is the Lady Arpels Ronde des Papillons that features an unusual time display mechanism. The hours are indicated by a swallow that is a retrograde hand, starting at “0” and travelling to “12” before returning to its origin. More unusual is the minutes display, which is indicated by orange butterflies, each travelling at a different speed thanks to an elliptical gear. Pressing the button at eight o’clock will start an automaton so the butterflies circle the dial before returning to their time-telling position. 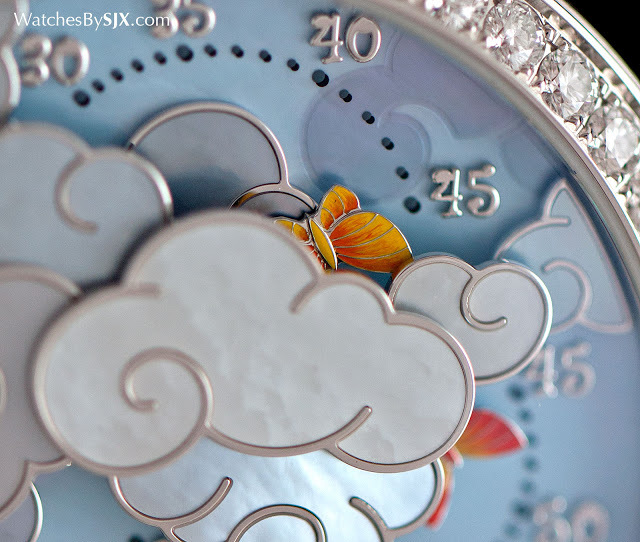 Mother of pearl in different shades is used for the multi-layered dial, forming both the sky and the clouds. 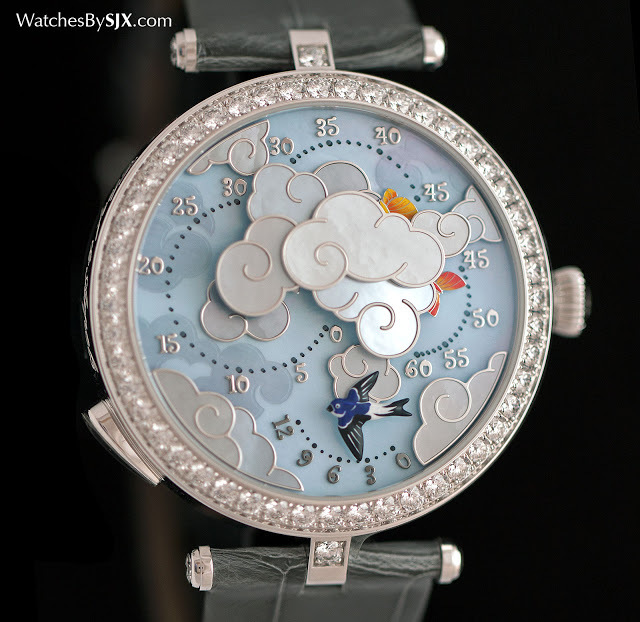 The clouds are actually white gold discs with mother of pearl inlays, while the applied numerals on the dial are also white gold. 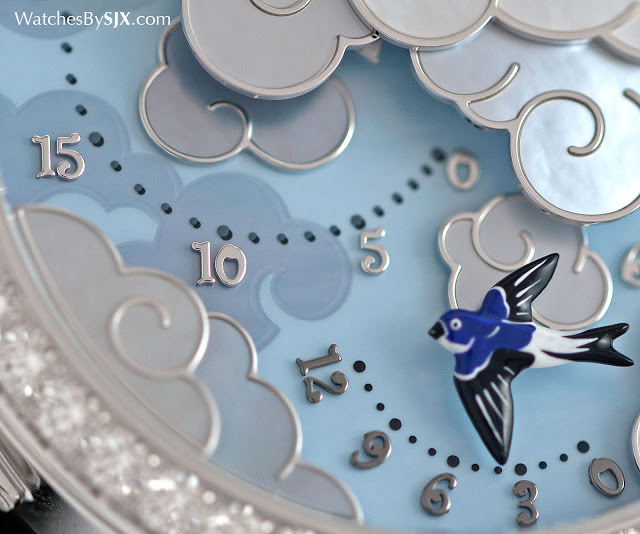 Both the swallow and butterflies are made of white gold, then engraved and painted by hand. The case is white gold and 38 mm in diameter, with an automatic movement developed by a specialist for Van Cleef & Arpels. Though the identity of the movement maker was not revealed, it might be Agenhor, the Geneva-based complications maker that has worked extensively with the jeweller in the past. The Lady Arpels Jour Nuit Fée Ondine is similarly decorative but less complicated, powered by an automatic movement with a 24-hour day and night disc. 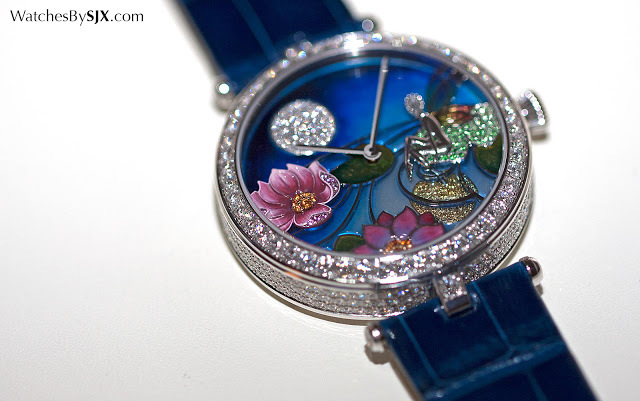 Executed in mother of pearl, precious stones, enamel and miniature painting, the dial depicts a fairy sitting on a waterlily, gazing at the sky. 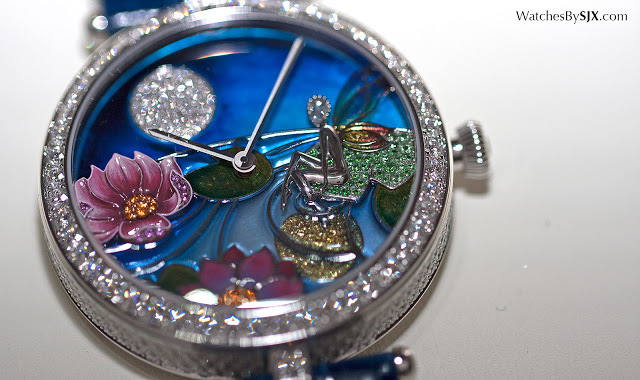 Both the water’s surface and waterlilies on the dial are made with the plique-à-jour enamel technique, one that is similar to creating stained glass, with the enamel painted onto a precious metal frame. The upper half of the dial is actually a day and night disc made of mother of pearl that makes one rotation every 24 hours. During the day it shows the sun set with yellow sapphires, while at night a diamond-set moon takes it place. 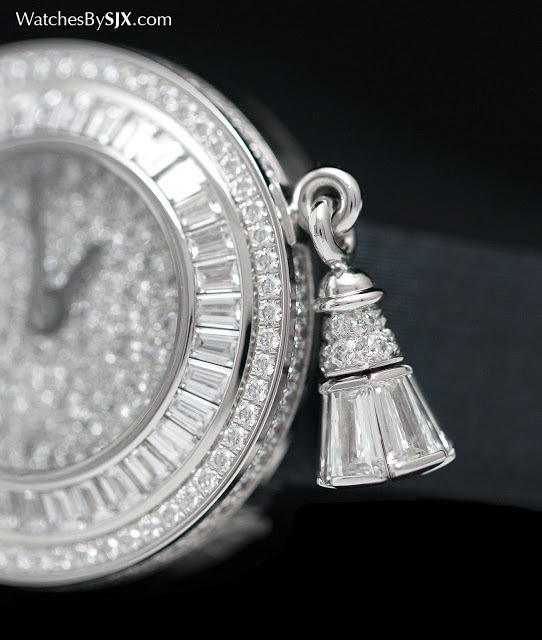 The entry-level model of the SIHH 2016 collection is the Sweet Charms Pavée, a small, 21 mm wristwatch set entirely with diamonds with a free-spinning ring around the case that features a diamond set pompon. 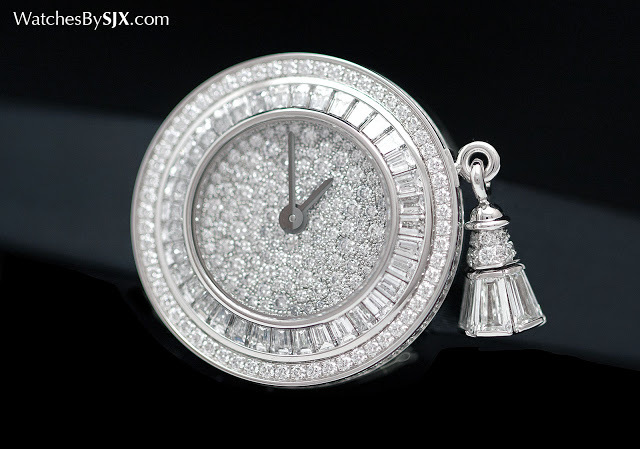 The smallest sized watch of this type made by Van Cleef & Arpels to date, this has a quartz movement. Links to the rest of our SIHH reports below.